Lucas Richman conducting the Bangor Symphony Orchestra. The Bangor Symphony Orchestra this season is serenading its audience. Sunday was the second time Conductor Lucas Richman and the orchestra have wowed concertgoers with a piece titled Serenade. In November, the BSO performed Leonard Bernstein’s piece, composed in 1954. The audience adored it. The orchestra on Sunday shrouded the audience in Antonin Dvorak’s work by the same name and got a similar reception from concertgoers. 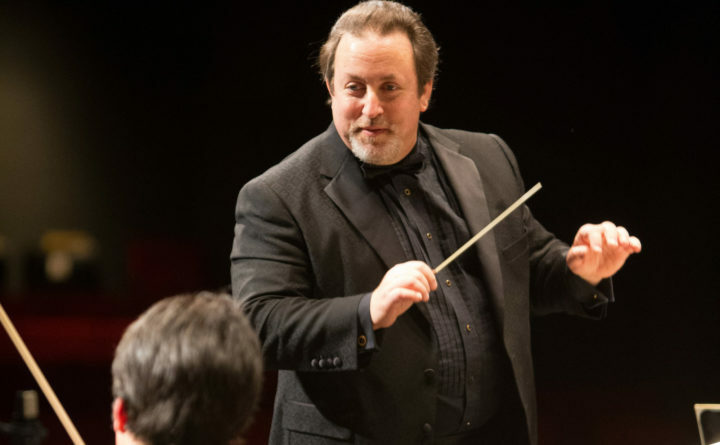 Both pieces were the highlights of programs with more familiar but less rewarding works — Ludwig von Beethoven’s 4th Symphony in November and George Frideric Handel’s Concerto Grosso on Sunday. The BSO three years ago added a concert in January to its schedule. It was designed to use fewer musicians than required for composers such as Robert Schumann and Dmitri Shostakovich, whose works will be performed next month. On Sunday, just the string players performed and the music was selected with that in mind. The early winter concert also was created to allow orchestra members a chance to solo. On Sunday, the soloist was Edward Allman, the orchestra’s principal bassist. He performed Johann Baptist Vanhal’s Concerto for the Double Bass. Composed in the latter 18th century, it sounded Sunday as if it was written to demonstrate for audiences just how many different sounds the instrument is capable of making. For concertgoers whose first encounter with classical music was the score to cartoons, the huge instrument sounded like bears playfully wrestling. Other times, the double bass gave off a rumbling sound, as if the stomachs of every member of the audience were grumbling at once. Allman performed with precision and gusto to an appreciative audience but was unable to overcome the piece’s flaws. The dissonance of Vanhal’s concerto coming after the quiet sweetness of Handal’s Grosso Concerto was unsettling. Just as Bernstein’s Serenade is in praise of love, Dvorak’s piece is a sonata of love, longing and appreciation for his wife, family and the emotions that can be expressed through music. Dvorak’s Serenade felt like a soothing balm after the Vanhal. The strings swelled and filled the nearly 1,500-seat Collins Center for the Arts and wrapped concertgoers in a warm blanket of sound. The compositions chosen for these January concerts that require fewer musicians more often than not feel and look lost on the large stage. A smaller venue would make the concerts feel more intimate and concertgoers might experience the music of Handel and Vanhal as the first audience that heard it did.